Coming straight from their previous success, Master’s Sun, the Hong Sisters caught my eye with Warm and Cozy. The cast was solid, and the writers have been nothing but successful. However, I realize I had too much faith in a drama that seemed liked one big tourist ad for Jeju Island. Warm and Cozy gives us noble idiocy disguised as innocence, mixed with formulaic episodes — and it just doesn’t work. There’s no doubt why: it quickly became repetitive, boring, and dull. Warm and Cozy is one big tourist ad for Jeju Island. What makes Warm and Cozy really disappointing is that if it wasn’t so slow, and if each episode had contributed to the plot, it could have been a lot better. Unfortunately, the viewers are left with the sense that they could have skipped any episode and it would not have made a difference. The story never got fleshed out to its true potential, and that’s what was so disheartening about the experience. The opening scenes of Warm and Cozy show promise. Teenage Baek Gun Woo (Yoo Yeon Seok) is having an extravagant birthday party when he notices Lee Jung Joo (Kang Sora) about to approach his mother. He drags her away to find out the reason she’s there: she’s his twin! This is where we begin to get a glimpse of what our characters are like. Gun Woo dismisses an expensive gift simply because it’s the wrong color, and Jung Joo explains that all she has are hand-me-downs so she can’t afford to be picky about color. It’s clear that Gun Woo is someone who has had everything handed to him and can be hard to please because he’s spoiled. Meanwhile Jung Joo struggles financially and can only afford second-hand things. She takes it all in stride and doesn’t complain because she is well aware that her situation will not change. Then, the drama leads our heroes to Jeju Island. After we learn that Jung Joo is not Gun Woo’s twin, they inappropriately flirt a little, and part ways. Ten years later, Jung Joo finds herself out of a job, with no home, and dumped by her boyfriend. 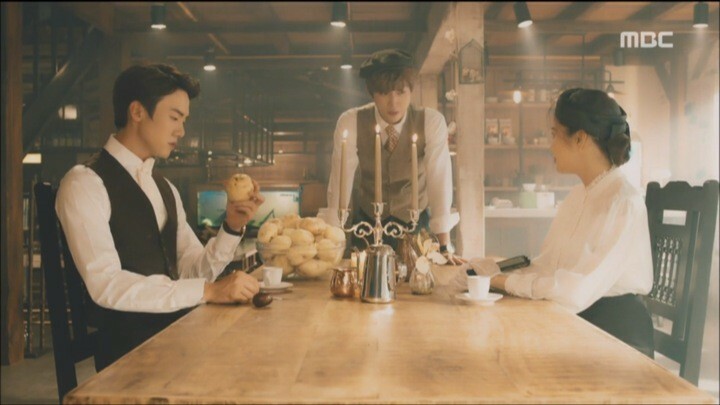 Feeling pity for her, and mistakenly believing that she is dying, Gun Woo offers her his restaurant, Warm and Cozy. Just like that, their paths cross again and they’re ready to embark on a new journey together. The first three episodes also introduce us to the locals of the island: Mayor Hwang Wook (Kim Sung Oh), female diver Kim Hae Sil (Kim Hee Jung), and Gun Woo’s brother Jung Geun (Lee Sung Jae). With an abundance of nosy characters and t he romantic storyline established, I expect Warm and Cozy to be a fun, lighthearted drama. We soon learn that Gun Woo is not all so altruistic. He originally opened the restaurant for his first love, Mok Ji Won (Seo Yi An), hoping that she would visit. Now knowing that Ji Won is staying in Jeju Island, Gun Woo starts to do something we will see often in Warm and Cozy: backtrack. He goes from wanting nothing to do with the restaurant to trying to get his way all of a sudden. Gun Woo claims that Jung Joo won’t be able to run the restaurant by herself, and offers his services. He also coaxes her into letting him stay with her. It gets quite annoying as the viewer will see Gun Woo do this often, with very little character growth. These episodes slowly bring in more romantic tension between the characters as well. We see Gun Woo jumping through hoops to do everything for Ji Won while the mayor becomes interested in Jung Joo. These episodes also mark the beginning of a very long and boring pattern. Gun Woo is sweet and naive, but is blinded by love when it comes to Ji Won. He doesn’t care who he hurts while romancing her. It’s this part of him that makes Warm and Cozy particularly hard for me to watch. We’re about halfway through Warm and Cozy now and I can’t help but feel that it’s missing something of substance here. Other than the characters’ flirting with each other and living their day to day lives, nothing of significance is happening. Their relationship ends up in an extremely repetitive formula. Gun Woo abandons Jung Joo because Ji Won calls him, and this is where our narrative begins to lose clarity. Gun Woo is slowly falling for Jung Joo unintentionally, which leads him to fight for her attention with the mayor (all while Jung Joo is oblivious). While the mayor acknowledges his own feelings, Gun Woo still struggles to pinpoint exactly what his feelings for Jung Joo are. We can see that he has the mindset of “if I can’t have it, then no one can” towards her. Unfortunately because of this, their romantic relationship ends up in an extremely repetitive formula: Jung Joo and Gun Woo argue for a bit, then inevitably make up. Gun Woo learns a bit of new information about Jung Joo, and Jung Joo learns more about Gun Woo’s past, but this knowledge ultimately leads nowhere. He still acts the same way towards her and she still feels the same about him. The only saving grace is the progress in the secondary characters Jung Geun and Hae Sil’s relationship. It’s a pity that they’re not the leads of the drama, because I’m more invested in their romance than I am in our actual main characters. We finally begin to see some progress between Gun Woo and Jung Joo’s relationship during these episodes. The locals help Mayor Hwang Wook get a date with Jung Joo (and by “get a date” I mean they trick her into it). 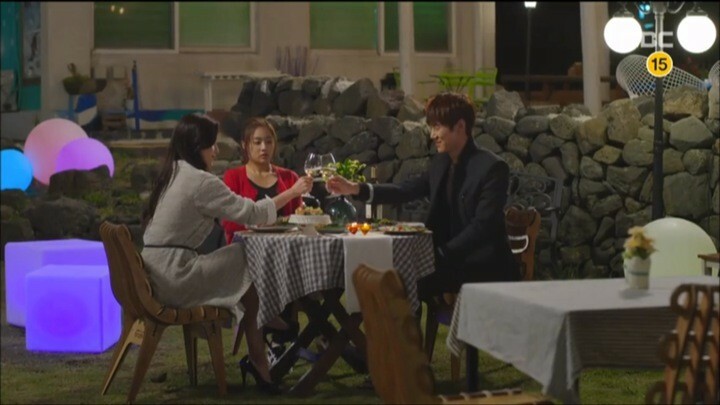 However, it fails and Jung Joo ends up going on a date with Gun Woo. Gun Woo realizes his feelings, but it’s all in vain because Jung Joo thinks he’s only teasing her — again. Gun Woo truly got himself into this situation with how many times he’s teased her and left her for Ji Won. So, he’s not getting any sympathy from me. At the same time, a novelist has put together Gun Woo’s father’s past, which also ties into Hae Sil’s. I’m assuming that Warm and Cozy wants us to ignore laws preventing writers from making a story out of someone’s life without their permission, because otherwise this plot makes no sense. It’s a plot device for the viewers to uncover everyone’s past, but it falls flat and there could have been a better way to do so. You know you should have dropped a drama when you’re glad it’s over, which is an understatement to how I feel about Warm and Cozy. During the last arc, Gun Woo does what he does best: handle a situation immaturely. But of course, everything works out for him. Jung Joo gets the shorter end of the stick because her character goes through so much hassle and ends up falling in love with someone who doesn’t care until the very end. Then suddenly, the drama makes her one-sided love seem like it was worthwhile all along. These last few episodes are slow and boring — but that’s nothing new. The drama has had an incredibly slow pace since the beginning. Although I expected it to be fun and entertaining, the comedy falls flat and the romance is frustrating. It leaves a stale taste after each episode, and frankly I’m surprised I watched all of it. I could go on and on about how dull and repetitive this drama is, but I won’t. Instead, I implore you to simply not watch it and spend your valuable time on something more enjoyable.